finished chest 36 through 56 inches. 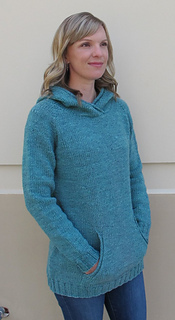 A loose fitting comfy hoodie knitted with heavy worsted at a stitch gauge of 16 stitches to 4 inches. Because the side shaping is optional, this sweater is suitable for men or women, and very popular with teens. 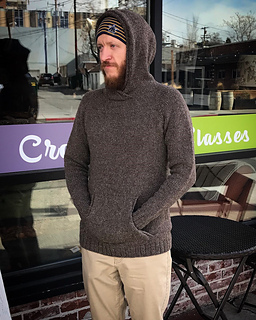 A knitted in pouch pocket keeps hands warm, and the hood looks good up or down. Finished measurements 36 to 56 inches. 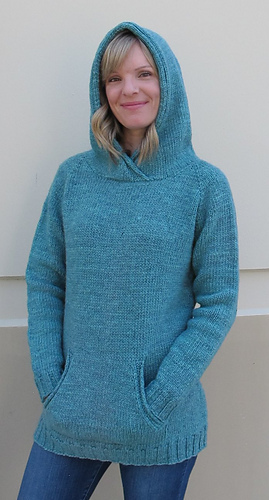 Yarn shown is Lanaloft by Brown Sheep.